Thanks for carrying the torch! You've made us all proud. Yes, the car looks good doesnt it! so timeless. I like the side view where its lifting two wheels before an instant transition to the right for turn 2. It never had enough grip to do that in the past, that camaro , btw, is not really a camaro (you may know this) man, it is a complete lightweight version of a nascar (TransAm2, tube frame and all powered by a Z06 motor. the winner was driving one, there was another one that blew an engine that was running in my time range too.. but even with the much stickier tires, 40 min race, the and over 120 hours of racing + street on the engine, it still runs like a champ! Next year, ill be driving it to the track again too. that camaro , btw, is not really a camaro (you may know this) man, it is a complete lightweight version of a nascar (TransAm2, tube frame and all powered by a Z06 motor. the winner was driving one, there was another one that blew an engine that was running in my time range too.. but even with the much stickier tires, 40 min race, the and over 120 hours of racing + street on the engine, it still runs like a champ! I didn't know, but I sort of guessed. I told him he'd need to meet me on the track now, since you've already demonstrated the essential components of 928 dominance. Looks like GREAT time was had by all!! 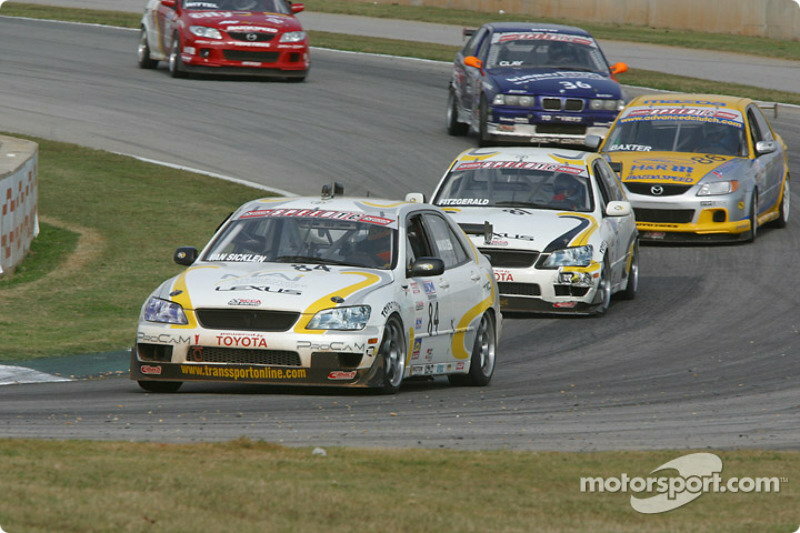 Me in my the World Challenge Lexus @ Road Atlanta. hey, you are ahead of our buddy clay! was that in 05 or 06' ? Last edited by mark kibort; 11-09-2018 at 08:03 PM. Mark, what size are your rear tires? In the last pic they look small, like a 295.
they are SOOO small compared to what i use from hoosier. the sizing is different and the real slicks are much smaller than DOT tires. (my normal 315x30x18) they are 30 x 65x18 Mich. and they are about the same size as a 295 , from what ive measured. (good eye) on the front, they wrere screaming. the 27x65x18 is like a 285 , also tiny. what i want is to put the 30x65x18 on the 10" front rims , but they say it wont fit. (they dont have that "cheater" bead shape like a street tire has.) when i used the Hoosier slicks 320x650x18s they worked on the rears, but the only tire that would work up front was the 305x645.... which makes me think that the 30x65 might work. worst case, i would like to try the rear tires up front.. but yes, the rear tires are pretty small. the next size up is a 310 but its a 680 which makes it over 26" tall and that might be a problem hitting the inner body structure. those days are gone as it will be a LONG time before i buy a set of slicks again. however, i might buy another set of the hoosiers if i run a partial season next year. -Sun., Dec. 30, 7 p.m. Eastern; F Production (encore Sun., Dec. 30, 1 a.m. Eastern)Mike Cobb, SCCA President and CEO, said exposure on CBS Sports Network gives the Sports Car Club of America® an opportunity to showcase its exciting brand of road racing on millions of televisions in homes across the nation.“The eight races selected for broadcast this year were chosen based on the quality of competition, the ability to connect with a wide audience, and the desire to display a spectrum of SCCA Road Racing activities,” Cobb said. “It is my hope that every SCCA member will tell friends, family, co-workers, neighbors and acquaintances that the Runoffs will be airing Sundays on CBS Sports Network in December. It’s a great way to share with others exactly what SCCA Road Racing is all about.”The SCCA National Championship Runoffs has evolved into what is now commonly agreed to be the pinnacle of American motorsports. Since 1964, the SCCA has crowned Road Racing’s National Champions at the winner-take-all, single race Runoffs format through dozens of separate races over three days. As host of the 55th Runoffs, Sonoma Raceway became only the third California track to host SCCA’s National Championship, joining Riverside International Raceway and WeatherTech Raceway Laguna Seca. Each race on Sonoma‘s 12-turn, 2.52-mile circuit was 20 laps or 40 minutes, whichever came first.With broadcasts presented by Mazda, all 28 Runoffs races from Sonoma Raceway are available for online viewing anytime at the 2018 SCCA Runoffs OnDemand webpage at SCCA.com.The Sports Car Club of America®, Inc., founded in 1944, is a 67,500-member motorsports organization that incorporates all facets of autocross, rally and road racing at both Club and professional levels. With headquarters in Topeka, Kansas, the SCCA annually sanctions over 2,000 events through its 116 Regions and subsidiary divisions. Much of the SCCA’s activities are made possible with support from the following Official Partners: Chevrolet, the Official Truck of the SCCA; Hawk Performance, the Official Brake Products of SCCA; Mobil 1, the Official Oil of SCCA; Sunoco, the Official Fuel of SCCA; and Tire Rack, the Official Tire Retailer of SCCA. To learn more, please visit www.scca.com. I'd pushed the DVR button to record, and just took the time to watch the race coverage. Not a lot of screen time, but they gave a mention of the car and that not many 928's are seen racing. Hats-off to Mark for keeping the racing 928 in the public eye. Hats-off to Mark for keeping the racing 928 in the public eye. I dont think he is alone! i wish i could have stayed in front of him.... i think my tires were just too small! I know, but that was the overall goal... get the 928 out there, finish in the top 10, beat best lap time in past 10 years by 1 second or more, and have them say a few words about the 928!! MISSION accomplished! some might say those were not lofty enough goals and to them i say, "you know what.........just do it! " Starting a different fight for the Porsche 928. found that it could run in Touring1 class. Now, that would make things a little more interesting, with a chance for it to win more often nationally. Guenther Steiner thinks Haas can do "a good job" once again in 2019. In 2018, the new American team surprised in its second year on the grid by finishing fifth overall. And Steiner thinks Haas can do it again. "When I look at the numbers, I'm sure we will have a good car," he told the Danish newspaper Ekstra Bladet. "But even last year, I didn't say anything about how good the others would be. Because I don't know. We are happy with what we see, but considering the new rules, has anyone found something that we haven't? How can I know?" However, Steiner said Haas' goal is to push again for fifth place in the constructors' standings behind the top three teams and the improving Renault. "Everyone wants to go for that position or even better," he said. "We have to do a good job over the winter, as we did last year, and make a good car. There are no secrets. Everyone is trying to get that position. If someone does a little bit more than us, they will be ahead and we have to live with that. And we will try to catch them again."